These maps illustrate that the heaviest concentrations of gun violence are in big cities. 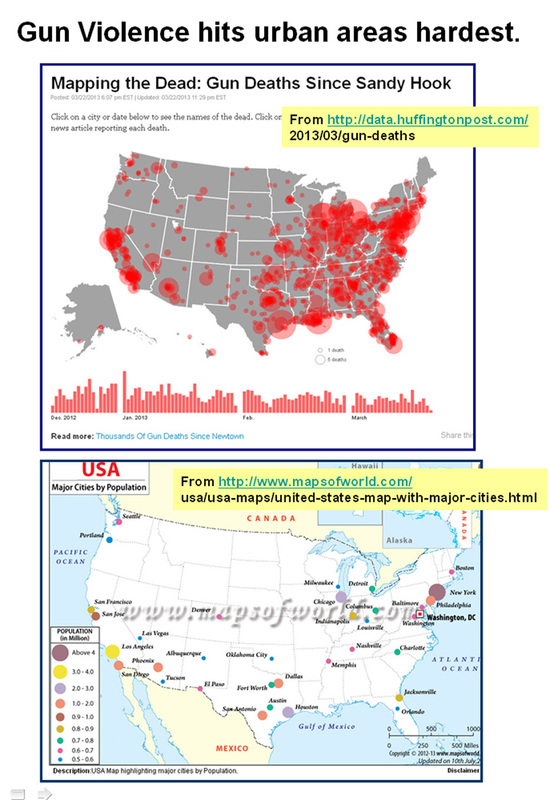 The top map is from a March 22, 2013 Huffington Post article and the bottom is from the Maps of the World web site. To me the maps illustrate the challenge we face in obtaining national political consensus on any type of gun control, or effective education policy. People in some parts of the country don't live with the same problems that people in other parts live with. Big city problems are far different than problems of smaller communities and rural areas. In a system where votes are tied to geography, getting enough votes to support policies important to one or another geographic regions requires compromise, or tremendous empathy, or both. While we look for national compromise, I look to connect with people in big cities who have youth populations of 75,000 or larger, with concentrations of poverty isolated geographically and politically from the rest of the resources in their regions. If we can connect on-line and in face-to-face events we can talk in a common language, about common problems, and perhaps innovate ways to resolve these problems without dependence on national consensus. Join me on Facebook, Linked in, the Tutor/Mentor Connection on Ning.com, or in the Tutor/Mentor Leadership and Networking Conference held in the spring and fall. Or, invite me to places where you're bringing people from big cities together to innovate solutions to these problems.